The question has come around to: How does a company present its employees? 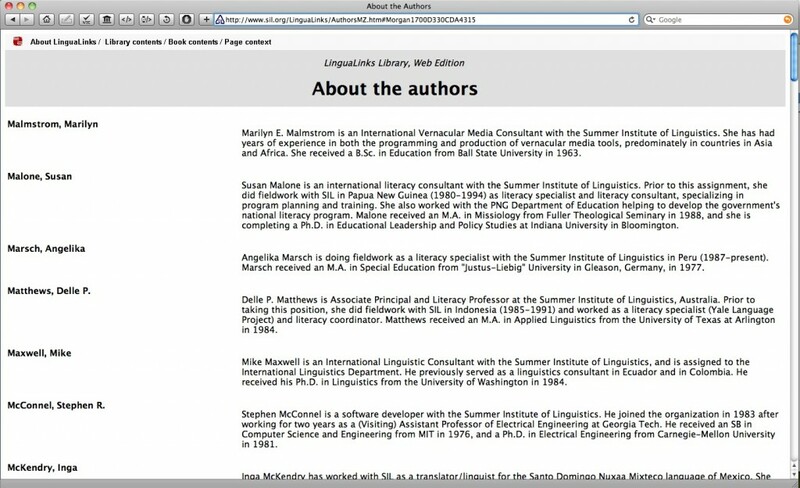 This question is interesting in an SIL web context because there are no less than 5 places, and potentially more, where SIL staff are presented on the web. As part of SIL’s NRSI working group. 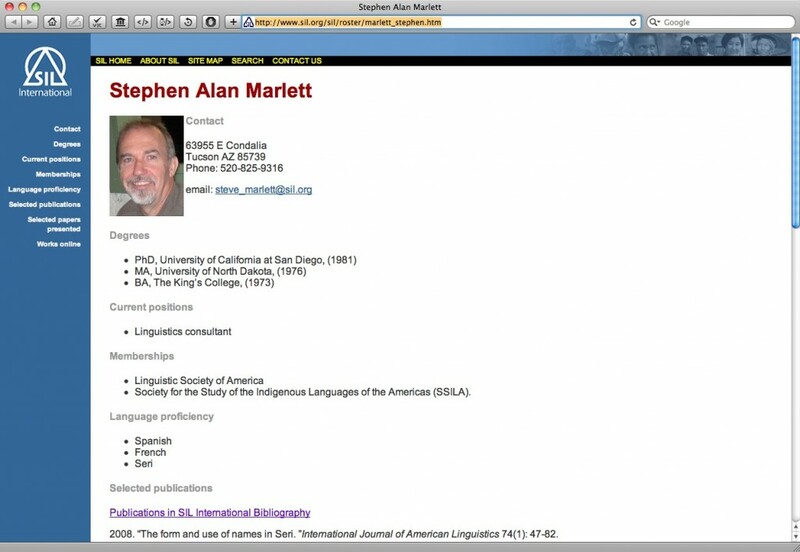 Lets take a look a Steve Marlett’s profile. 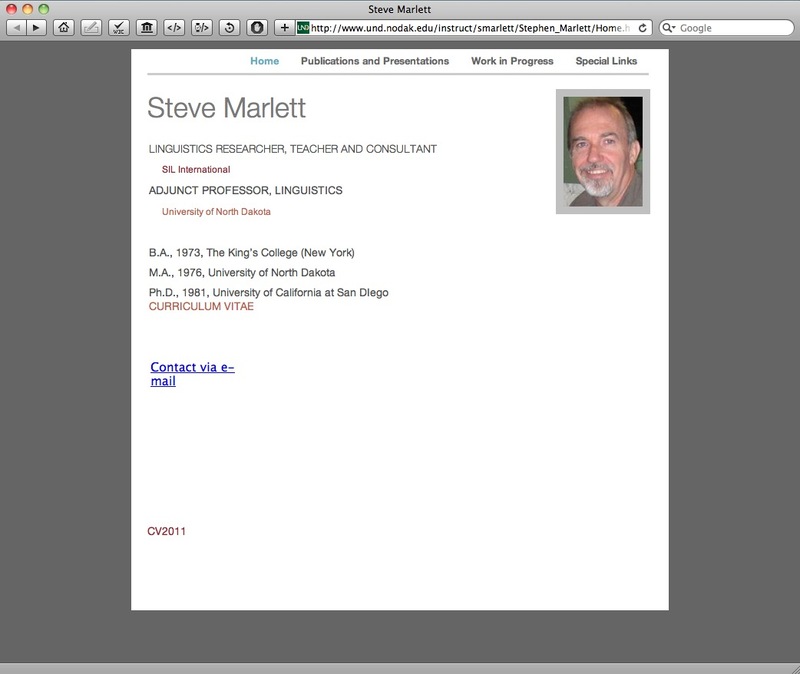 Steve is a well published linguistics consultant, former board member and a professor at SIL-UND and at CILTA. 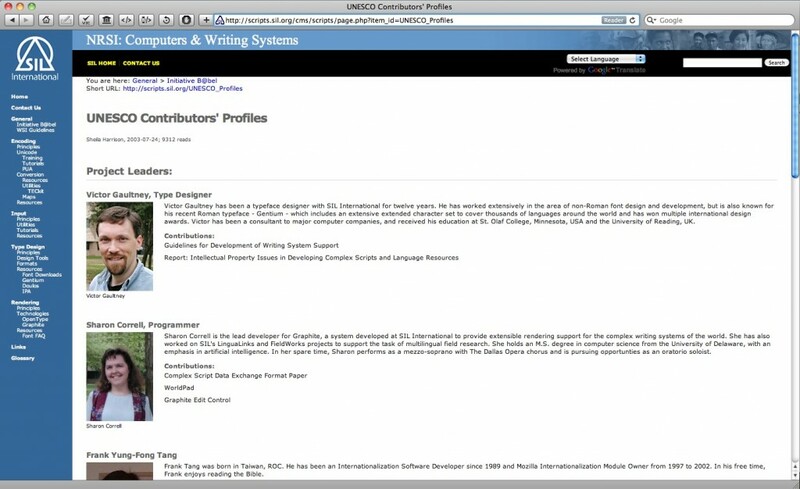 Here is a view of his SIL profiles or CVs. 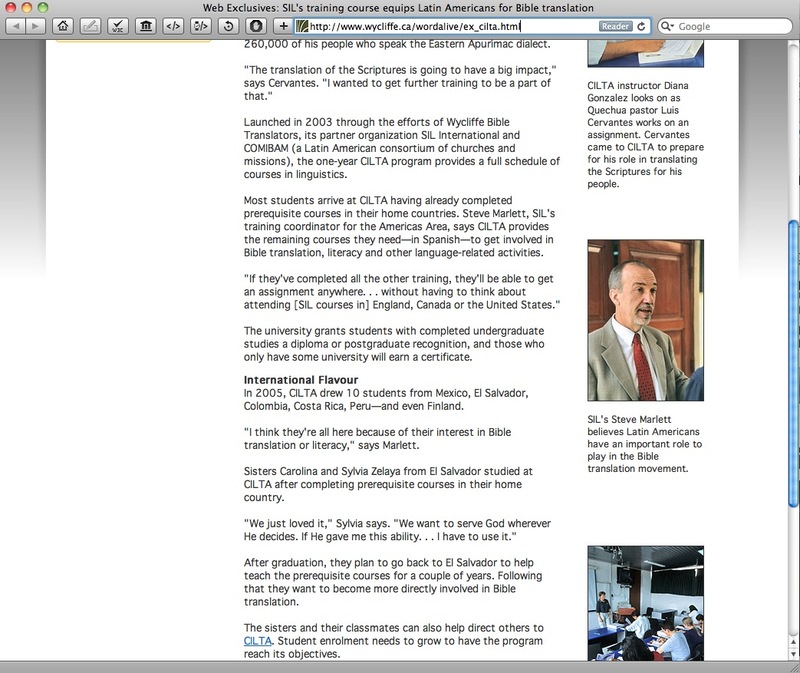 But SIL is not the only organization which talks about its staff. Wycliffe organizations like Wycliffe Canada do too. (This is because for the most part SIL Staff are not exclusively SIL Staff, they often are Staff of a Wycliffe organization, which through a series of contractual agreements, seconds employes to SIL as SIL Staff. [ref 1] ) So part of the equation for SIL’s web strategy is how does it present its people for its partners to talk about? 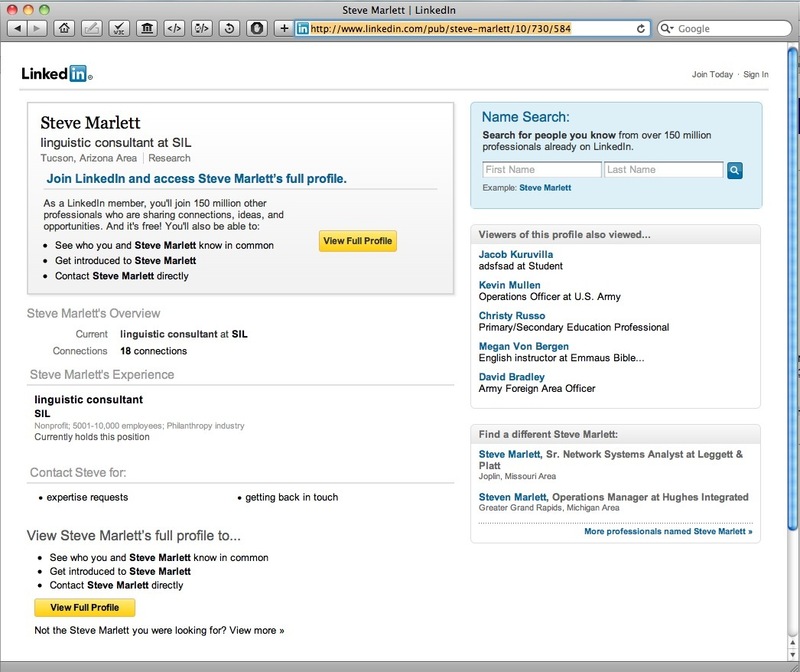 The use of these sites is primarily falls with in the scope of an online CV. 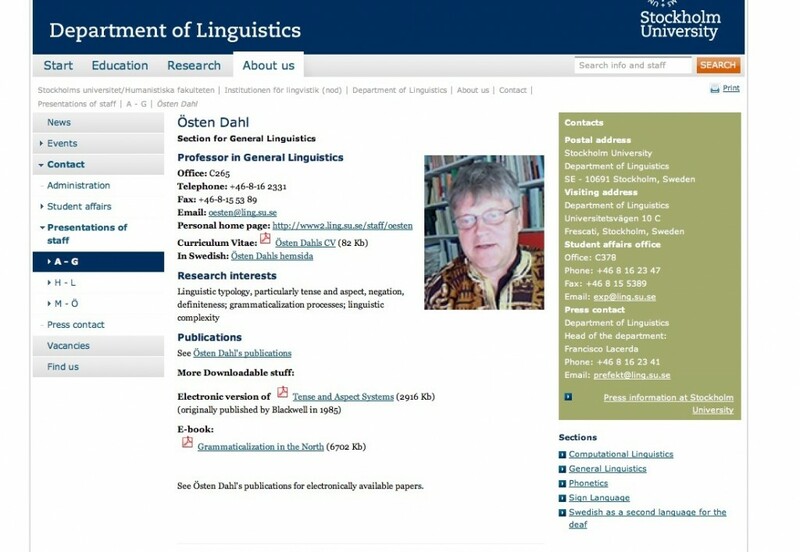 Though there are some other things going on like Ken Olson’s List of languages with descriptions in the Journal of the IPA. What I did not mentioned above is that if SIL.org were to have an interactive website, where there would be a sign-in feature, so this leads to the the question: Would there also be a public profile for that person who logs in? Could all of these public profiles be consolidated? If they were what would it look like? 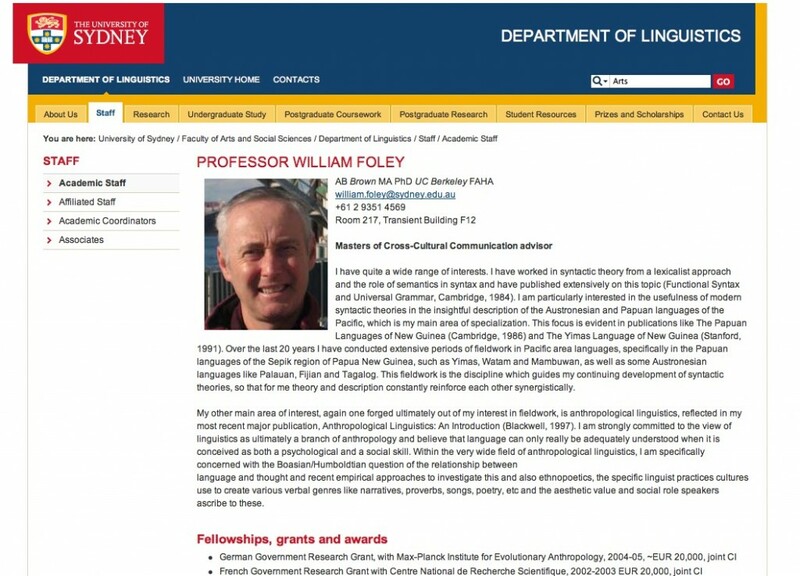 What do other professional institutions do to present their scholars and staff? 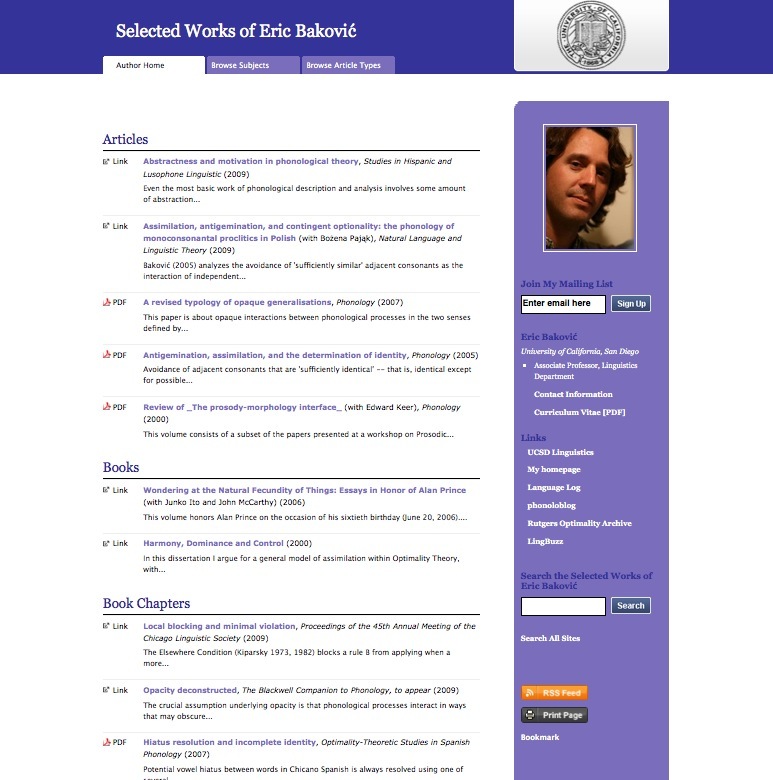 I have blogged about this previously talking about how Selected Works™ & BePress a product from Berkley University Press meets this market niche. 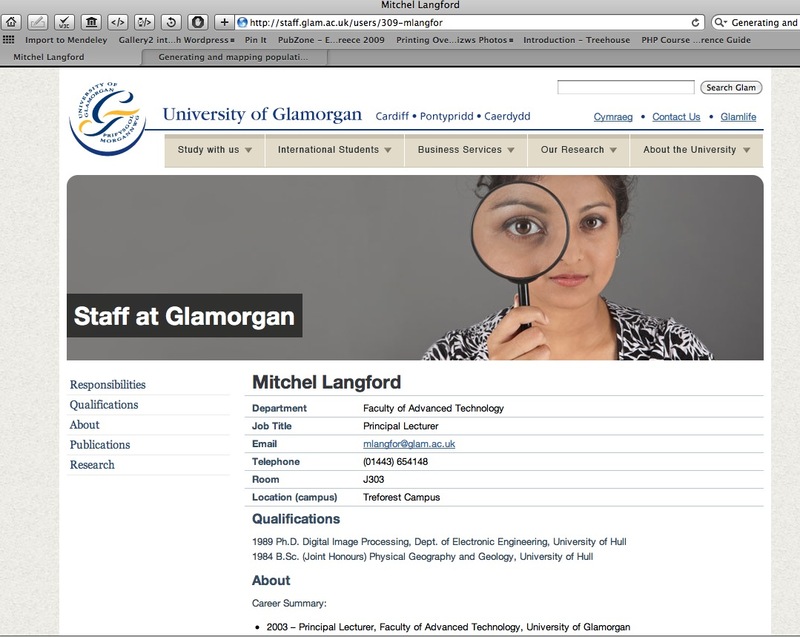 So, I have pulled together several screenshots from how other institutions allow or enable their professionals to have a public face. 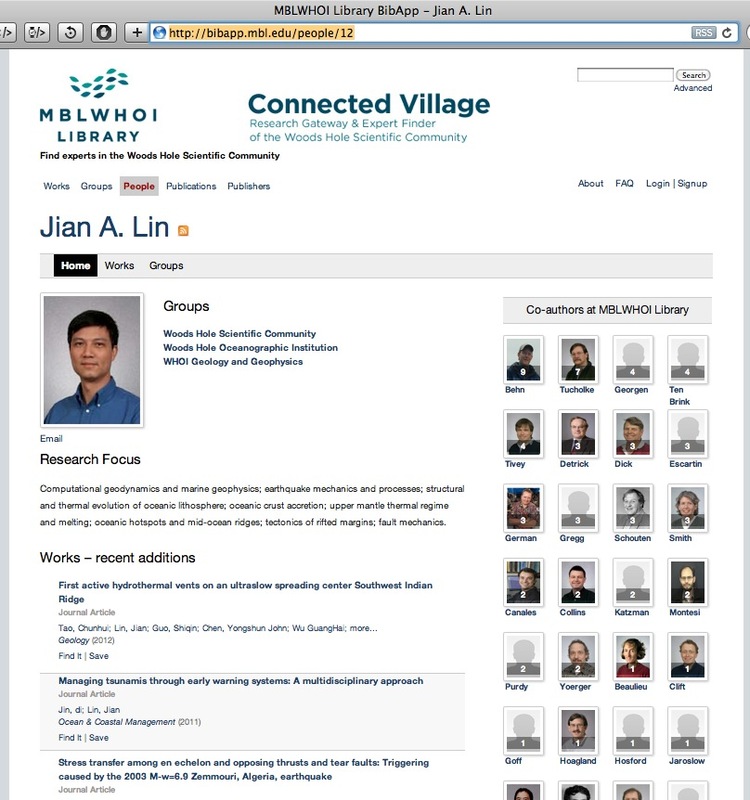 Bibapp is an application which can draw from Data in DSpace, an Open Source repository system. 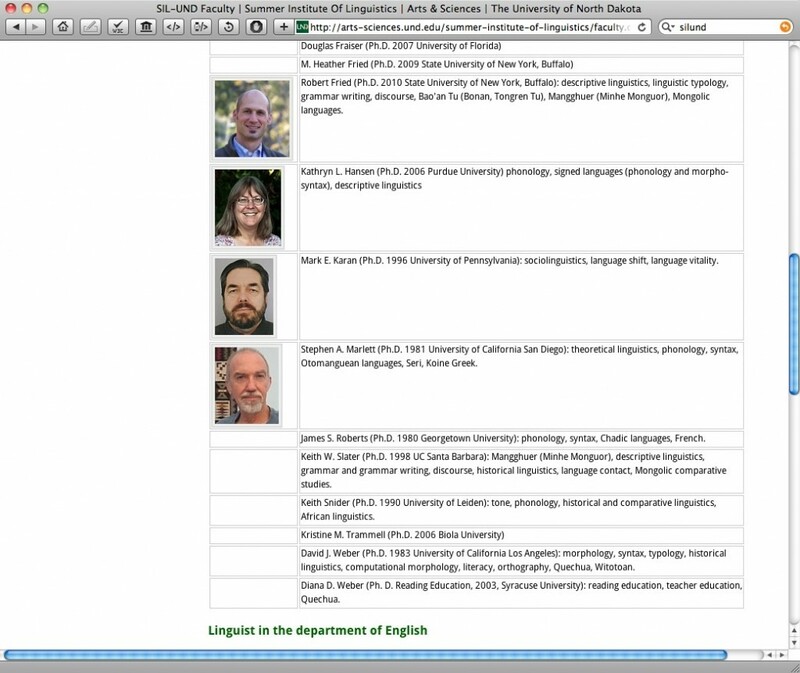 I am on the discussion list for Bibapp and one of the challenges for institutions which deploy this kind of technology is How does the institution get people to update their profiles? Often it is left to the department secretary to fill in the nitty-gritty. The answer to this problem is to deliver the profiles in such a manner so that the profiles actually provide a benefit to the people the profile is about. This encourages self-regulation and a greater degree of accuracy as the person is directly involved with the upkeep of the profile. 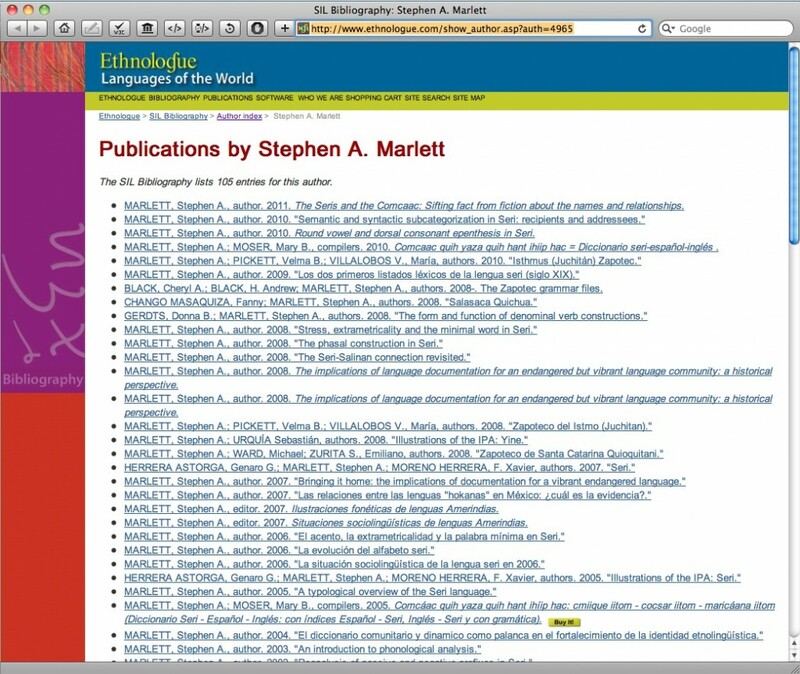 REAP[ref 2] IntegrationREAP is SIL International’s Institutional Repository, currently running on DSpace. 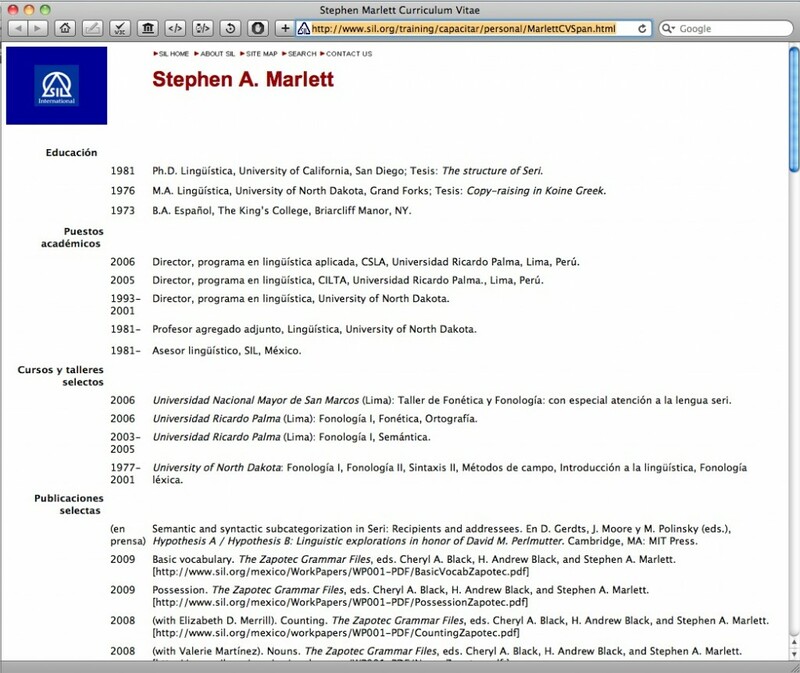 Starting with REAP integration, if a user wants to add a citation and a PDF download to their CV or profile then that integration with REAP should be built right into the CV editing form. 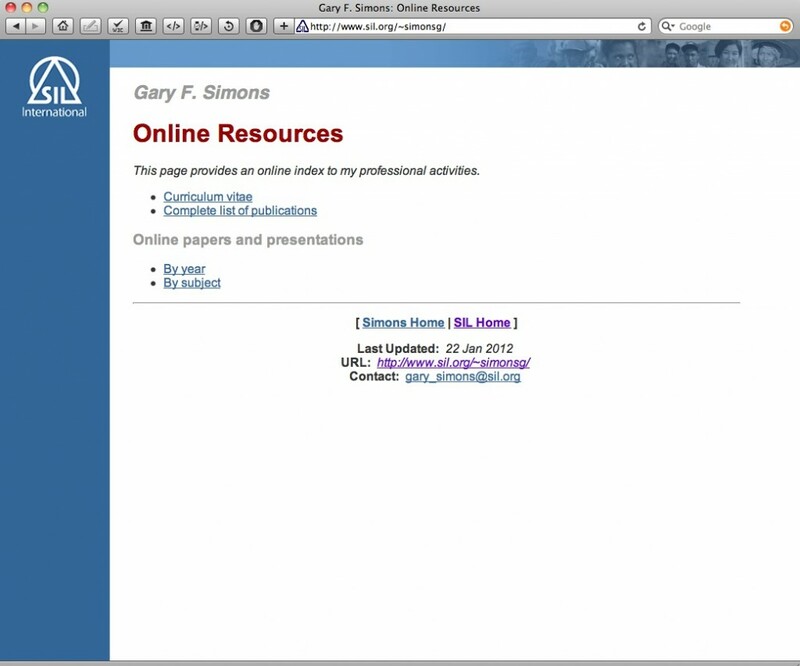 This allows for quick, functional interactivity with both SIL’s institutional repository and with the individual’s CV. 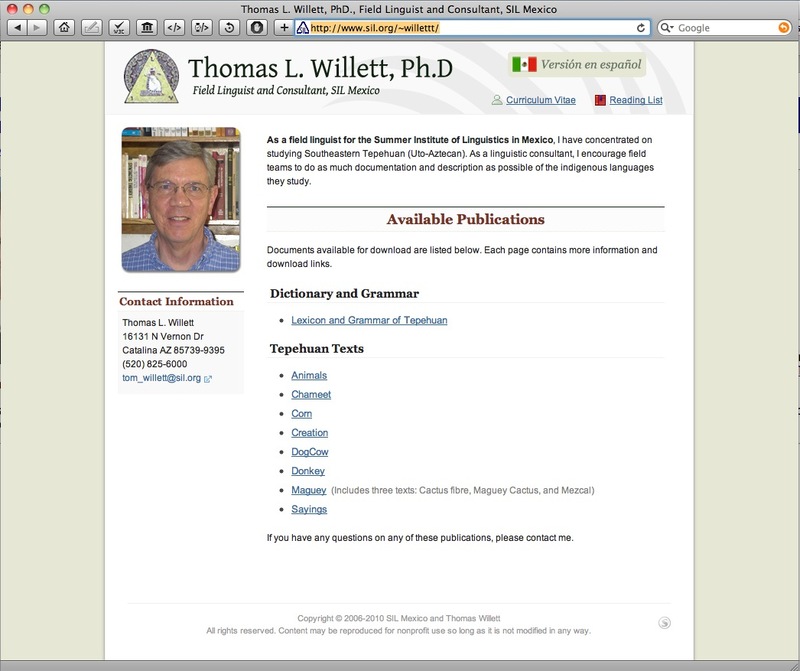 By providing a .txt output of the CV data you allow someone to grab the CV data and quickly do something with it. 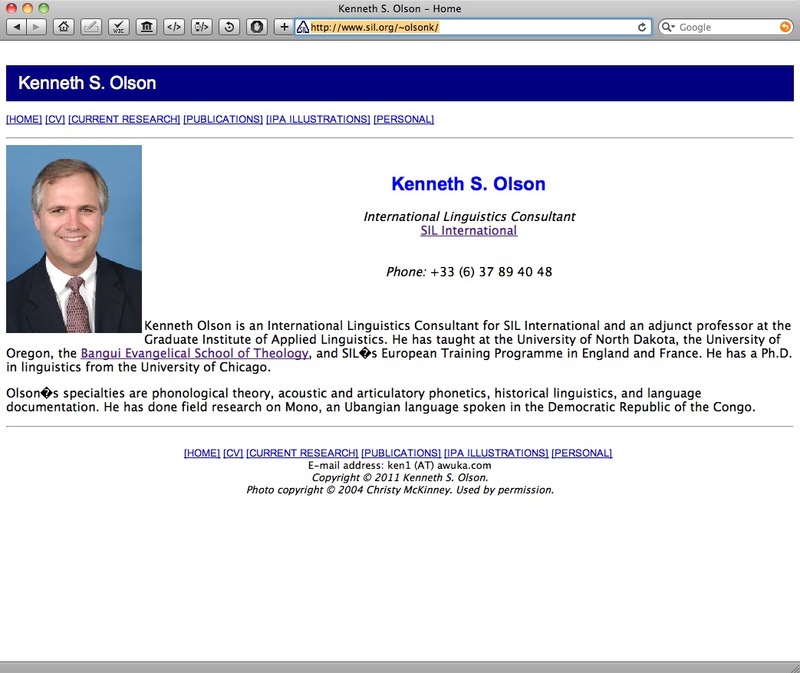 Here is an example from my personally hosted website: My CV is as http://hugh.thejourneyler.org/cv/ But I have a text feed at http://hugh.thejourneyler.org/cv/?feed=text and a JSON feed at http://hugh.thejourneyler.org/cv/?feed=json. 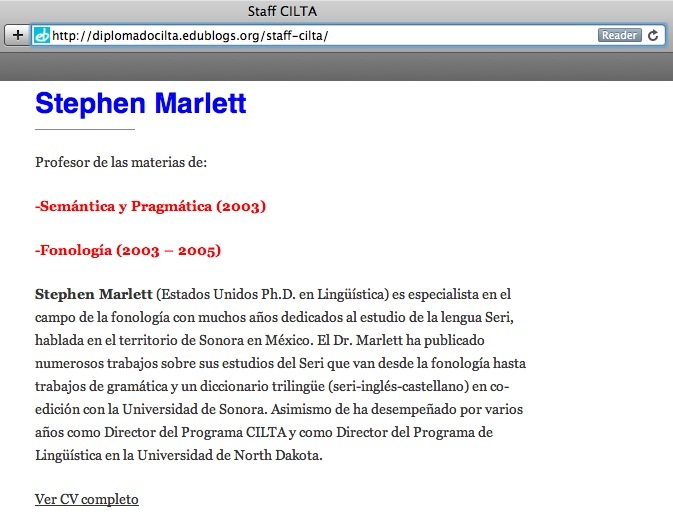 The real benefit to the host institution like SIL International is that it can provide a single editorial interface to CV’s and then use technology like JSON feeds to propagate that data to websites like CILTA. The final item, hResume, is a microfomat that the users should never see but allow search engines and web browsers to detect that the data is a CV. 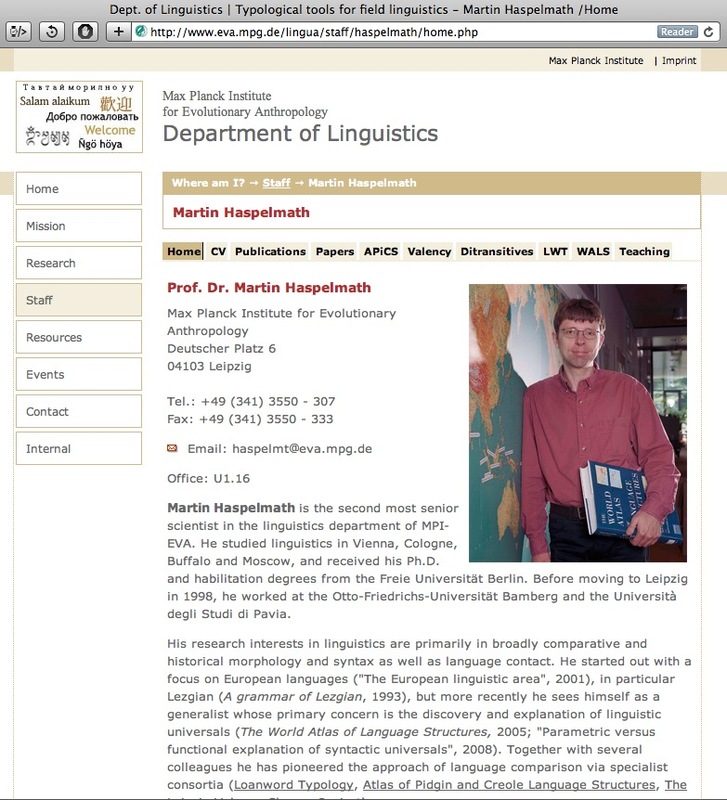 I have previously done some work to match a typical linguist’s CV with the hResume format. 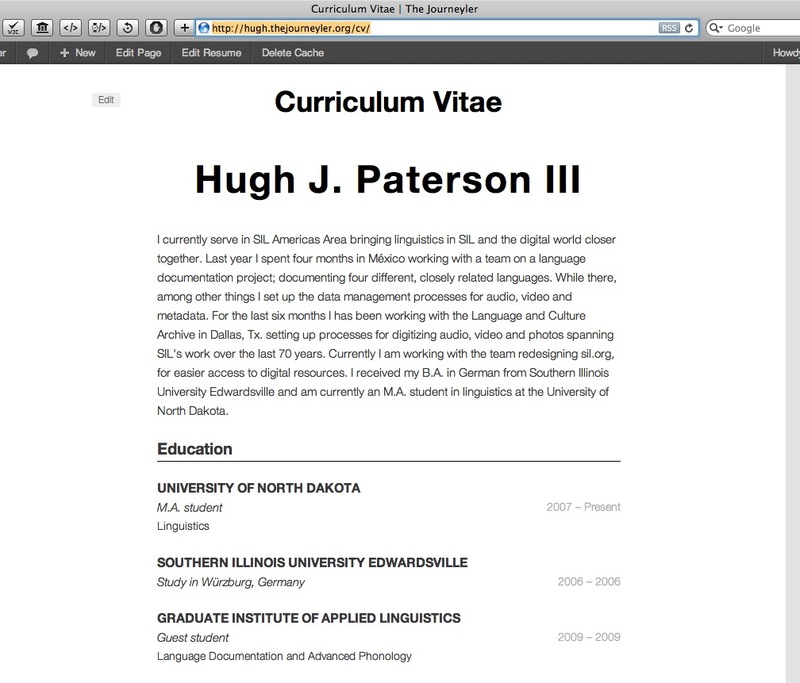 One important thing to view is that there are different sections of the online CV. This entry was posted in Business, Marketing, SIL International, UI/UX and tagged CV, hResume, presentations, Professional, sil.org, UX by Hugh Paterson III. Bookmark the permalink.